I began novel writing many, many years ago. After toying with a story idea for years, in 2004 I went to graduate school (for an MA) and again in 2010 (for an MFA) to find some guidance. ThereI completed not one, but two, manuscripts. My third manuscript, In A World Just Right, I began writing in the fall of 2011 and finished in January of 2012. 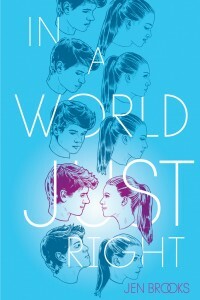 More than three years later–April 28, 2015–In A World Just Rightis now a book that anyone in the world may (hopefully) enjoy. 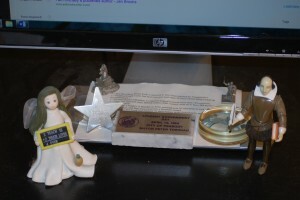 To mark the occasion, I will share a little something from my workspace. *–The first Harry Potter book is reported to have been rejected by 14 publishers. *–Stephen King’s Carrie had been rejected more than 30 times before being picked up for publication. *–Richard Bach’s Johnathan Livingston Seagull received more than 140 rejections. 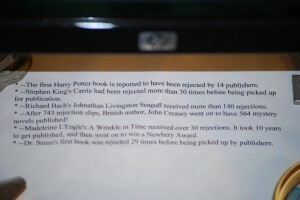 *–After 743 rejection slips, British authorJohn Creasey went on to have 564 mystery novels published! *–Madeleine L’Engle’s A Wrinkle in Time received over 30 rejections. 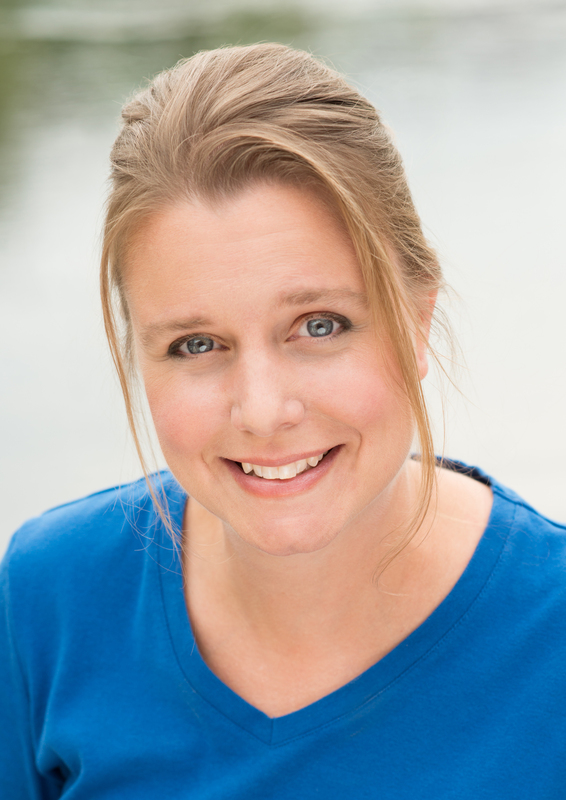 It took 10 years to get pubished, and then went on to win a Newbery Award. *–Dr. Seuss’s first book was rejected 29 times before being picked up by publishers. I have looked that this piece of paper every day for more years than I can keep track of. It has served as both an inspiration and a reminder of my goal. On this important day in my life, I am going to read it one last timethenput it away in my keepsake bin. It’s not that I don’t need inspiration anymore, but today, for me, marks the end of one phase of a journey. Thank you to all who have helped me get here! I first came across the term “New Adult” last year while writing a paper for graduate school. My understanding is that it was coined in November of 2009 when St. Martin’s press held a contest looking for stories that would appeal to an older YA audiencethose in their late teens and early twenties who are “new” to adulthood. It is a crossover audience of people too old to want to read 12-to 18-year-old-YA but looking for books that are like it with older characters. Apparently the “New Adult” wave hasn’t caught on. If you Google “college age protagonists” you will find a selection of blog entries and other articles on the subject. Two I found interesting are this and this. The first contains a nice summary of the issue then a number of interesting comments. The second I find interesting because the speaker is an articulate 16-year-old. Look here for rules and entries in the actual contest. I find myself intrigued by the whole New Adult concept and the debate over its worthiness and lack of feasibility. What is it? Huh? Huh? I can’t think of a YA book I’ve read that didn’t feature a young protagonist, but I feel this criterion alone is insufficient. Anyway, I’m not alone in thinking it would be nice to see some 18- to 26-year-olds featured in novels. If the story is good, would it really not sell because of the protagonist’s age? Or is the one thing that really matters the shelf it gets put on in the big bookstore?